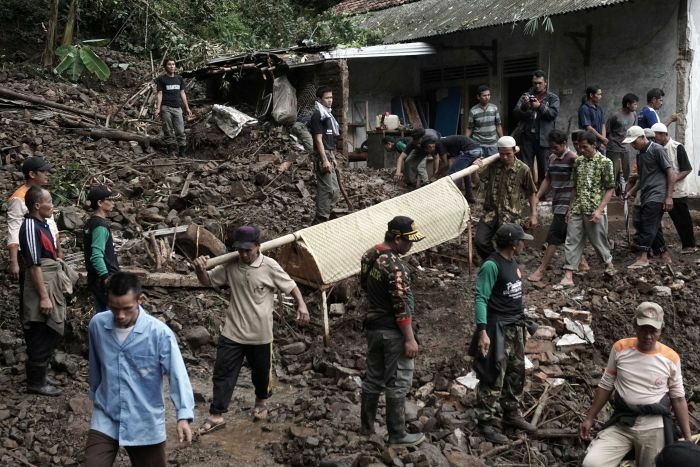 Jakarta, Dec 3: At least 20 people were killed and five others were missing as landslides and floods struck Indonesia's East Java province, a government official from the disaster agency said on Saturday. The landslides and floods were triggered by a cyclone from the Indian Ocean which also swept other provinces, Xinhua news agency reported. The number of people who are force to leave their homes increased to 2,050 on Saturday from 1,879 a day earlier as the natural disasters in Pacitan district of East Java province devastated 1,709 houses, spokesman of the national disaster management agency Sutopo Purwo Nugroho was quoted as saying. "Search for the victims is going on and evacuation has been carried out, involving personnel from disaster agency and search and rescue offices as well as soldiers, policemen and volunteers," he said. At least four people were injured in the floods and landslides, said Sutopo. The cyclone from the Indian Ocean triggered landslides, floods and whirl winds in 28 districts in the provinces of East Java, Yogyakarta and Bali. The cyclone occurred on Tuesday with 65 km per hour in speed, centring at 32 km in south and southeast of East Java province, according to the agency.